Crowne Plaza Hotels & Resorts is a stylish hotel in the heart of Tampa’s Westshore district, located at 5303 West Kennedy Boulevard, Tampa, Florida 33609. The management of Crowne Plaza decided they needed to make their outdoor parking lot brighter in order to provided not only added safety and comfort for their customers, but also to save on energy consumption, as well as reducing the recurring maintenance cost. 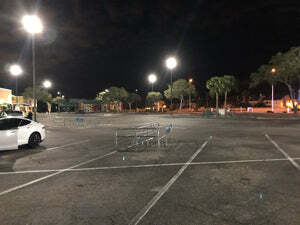 Their lighting system at the time was not producing optimal emissions, as they were using inefficient 400W and 500W Metal Halide Parking Lot Light Fixtures which was experiencing low light levels, as well as expensive maintenance costs. While metal halide bulbs typically have an average rated life of 3,000 hours, they typically lose over half of their original lumen output within the first 1000 hours of operating, which would make the parking lot go dim rather quickly. The main focus behind the HID to LED Retrofit for Crowne Plaza Hotels & Resort was to primarily reduce the overall energy consumption, reduce the outrageous recurring maintenance cost related to re-lamping, and above all, increasing the lighting levels throughout their outdoor parking lot to provide their valued customer, with added safety and comfort. HTM Lighting Solutions, alongside Henriquez Electric Corp , whom is a Full-Service Electrical Contractor in the Tampa Bay area, came up with a solution to meet the needs and requirements of Crowne Plaza Hotels & Resort. After carefully analyzing the existing light layout, fixture spacing, and running a new set of photometrics, it was determined that we could increase the average parking lot illuminance levels from 2.78fc to 5fc using HTM Lighting Solutions LED Retrofit Kits and LED Shoe Boxes. x5 other 400W Metal Halide Fixture, were replaced at strategic locations with 150W LED Shoe Box With Split Fitter Mount & Surge Protectors. The new 120W LED Retrofit Kits for 400W Metal Halide Replacement offered by HTM Lighting, each put out over 15,658 Lumens, with a high CRI exceeding > 83, and come with a 5-Year Warranty. Furthermore, the 150W LED Shoe Boxes that were also installed at the Crowne Plaza Hotels & Resort, each put out over 19,589 Lumens, featuring a TYPE III Distribution (Commonly known as "bat-wing"), and an efficacy of 131Lm/W. Although they come with a 5-Year warranty, and rated at over 50,000 Life Hours, the 150W LED Shoe Box use the latest, and highest rated Meanwell Driver, specifically manufactured for that application. Therefore, you should not have to worry for the many years to come, as you should kick back and enjoy your savings. The previous outdoor parking lot light system was costing Crowne Plaza over $5,660 per year in electricity cost alone. The new system using HTM Lighting Solutions’ LED Retrofit Kits, and 150W LED Shoe Box, will reduce their energy consumption to about $1,700, which results in annual savings of over $3,900/Year! The customer should therefore see a Return on Investment (ROI) in just under 15 months, based on Energy Savings Alone. Furthermore, taken an average use of 12 hours per day, at 7 days per week, the new LED Retrofit Kits are expected to last over 11.5 years, and enable energy savings of over $45,000 (based on energy cost reduction) throughout the lifetime of the new LED Fixtures installed.